If you are a new parent looking for the right baby equipment for your new baby, don’t forget to include a baby changing table. We selected 10 of the most popular baby changing tables on the market and looked at their construction, design, features, sturdiness, finish choices, safety features and more. The three baby changing tables featured below are at the top of the list for all of these categories. Any one of them would be an excellent choice. While a bed does work sufficiently if needed, a changing table is higher and puts the baby at a level that doesn’t involve you having to lean over uncomfortably. It is also much easier to clean should there be a “diaper incident”. There are many different kinds of baby changing tables on the market for parents to choose from. With all of these choices, it may seem like a daunting task to find the perfect one. There are a few things you will want to consider when you start searching for the perfect baby changing table. Taking these considerations in account can help ensure that you are happy with your choice and that the table you choose will last for a long time, especially if you plan on having multiple children. One thing to keep in mind is that many cribs have matching changing tables. If you want to keep all the furniture the same, be sure to check with the brand of crib that you have decided on to see if they offer changing tables as well. This guide will help make the process of choosing much easier and stress free. Another Delta beauty is this beautiful white baby changing table with strong wood construction. There are two open shelves that parents can use for diaper changing supplies or clothing. The water resistant changing pad with attached safety strap makes diaper changes comfortable and safe for the baby and it’s easy to clean up afterwards too. There are safety rails that go all the way around the top of the changing table which provide additional safety for the baby, but remember to never leave a child unattended on the changing table even for a split second. The white finish is non-toxic and has been tested for lead and other harmful elements and has been found to be safe as well as meeting and/or exceeding the ASTM and government safety standards. The simple and elegant design matches any nursery theme and makes a great baby shower gift for new parents as well. You will love the convenience of having a baby changing table when your baby arrives so you don’t have to bend over to change diapers anymore. Assembly is required but is not complicated and involves basic household tools. This uniquely designed baby changing table adds convenience and style to your baby’s nursery. There are three removable baskets that slide into place and make great storage for diapers, diaper changing supplies, extra clothing, toys and more. There is also a removable hamper to toss baby’s dirty clothing into that makes carrying the baby’s clothing to the laundry room super convenient. This simply designed, yet elegant baby changing table is made of solid wood and features a changing pad and safety belt on top that cleans easily and makes diaper changes more comfortable for your baby. The safety rails around all four sides of the top add more safety for your child, but they should never be left unattended while on the changing table, even for a split second. If you want to pull the baskets out and keep them somewhere else, you will have open storage shelves on the bottom portion of the changing table. The baskets are made of canvas like material and are ecru in color which matches any nursery theme. The baskets can be spot cleaned but should not be immersed in water. This changing table comes with a 30 day parts warranty. Delta provides parents to be with a beautiful baby changing table that will provide a convenient and safe place for you to change your baby’s diaper. 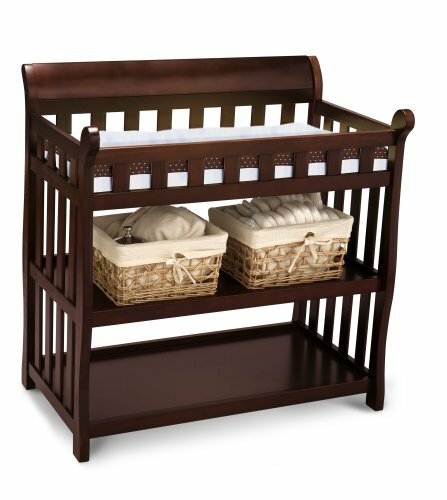 This solid wood crib has some wood composite pieces as well and meets all of the safety standards and anti-tipping standards that the government and ASTM require. It also has the JPMA certification seal to provide even more peace of mind. The safety rails wrap around all four sides of the top of the table. There is a water-resistant changing pad on top with a safety strap that is easy to clean. There are two shelves for storage that are open in design. The beautiful cherry finish looks wonderful in any nursery. Assembly is easy and requires very few tools. Use the open storage shelves for all the diaper changing necessities like diapers, wipes, lotions and changes of clothing. This is an excellent baby shower gift as well. Baby changing tables may not be mandatory baby supplies, but they certainly make life a lot easier when it comes to changing all the diapers that your baby will need changing the first year of their life. Their taller height makes them much easier on a parent’s back than using the bed and they are much more sanitary than using a counter top or kitchen island. All three of the top rated baby changing tables featured above, are beautiful examples of good quality changing tables that will make excellent additions to your baby’s nursery. They are made from solid wood and wood composite parts and all meet and/or exceed the safety standards set by the government and applicable agencies. Any one of these excellent choices would make a great addition to your baby’s nursery. If you would like to know more about choosing the perfect baby changing table for your child’s room, read the buyer’s guide below. We have provided helpful information that will make the selection process much easier. This information will help ensure that you make an informed decision as to which baby changing table meets your needs, preferences and decorating style the best. There are several things that you want to look for when you are shopping for baby changing tables. These features will ensure that the changing table you choose is functional as well as safe and stylish too. Sturdy construction – Sturdiness is one of the most important things to look for when it comes to a baby changing table. Since you cannot tell the sturdiness of an item that has to be assembled, the best way to ensure this feature is to check customer reviews and comments. People who have purchased the changing table and are using it are the single most reliable source of information when it comes to using the product in real world applications. Read the reviews to see what customers have to say about it once it is assembled. Solid wood items are going to be sturdier after assembly than pressed wood or wood composite items. Many changing tables have both, so look for models that are predominantly made of solid wood. Safety Straps – Some parents are adamant about making sure there are safety straps and others would rather not use them. Safety straps on the baby changing table provide additional safety but should never be relied upon as a safe place for the baby to lie while you turn your back, even for a split second. A good rule of thumb is to always have one hand on your baby, even when reaching for diapers, etc. Changing tables are great because all the supplies can be right within arm’s reach. Guardrails – Many changing tables have guard rails around the top of the changing that help keep the baby safely on the table. These guardrails should not be looked at as a failsafe method of safety on its own, but it certainly helps along with keeping one hand on the baby. Changing Pad – Most changing tables come with a changing pad that can be cleaned easily with a cleaning wipe. There are many different types of changing pads that a baby changing table can come with. The main thing to look for is one that can be easily cleaned. Fabric covered changing pads may feel more comfortable, but you will be washing that changing pad cover on a daily basis which isn’t very convenient. Storage Shelves or Baskets – One of the popular features of a changing table is the room it has to store diaper changing supplies, baby clothes, toys and other baby items. Some models have open shelves while others may have baskets that can be filled. This is a matter of personal preference as to which type of storage you like the best. There are even models of changing tables that have a changing table area on top of a dresser. There are several different styles of changing tables on the market. 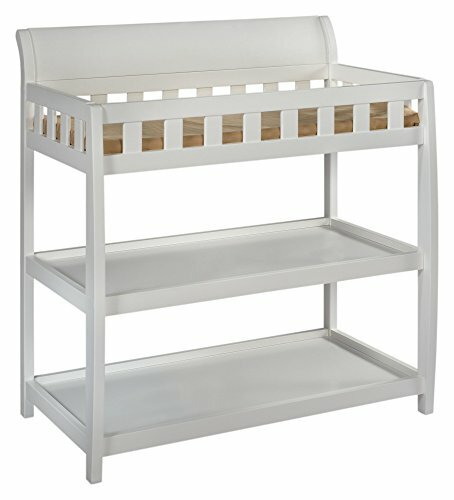 Many crib manufacturers create changing tables that match cribs and dressers so the furniture can all match. We have listed the different types of baby changing tables below. Freestanding changing table – This is the most common type of changing table that is purchased most often and is used in daycare centers and nurseries as well. This type has a changing area on top with guardrails and open shelving on the bottom for supplies. They come in a large variety of designs, finishes and sizes. The cheaper the price of the changing table the cheaper quality it can be so be certain you are getting a quality piece of furniture for your money. If you plan on having more than one child, you will want to opt for a higher quality baby changing table so it will stand up to daily use for years. Retractable Changing Table – This type of changing table is less common and not really a parent favorite due to the cost and the fact that it usually only has barriers on the two short sides which takes away some of the safety. Wall Mounted Changing Area – This is not as common in homes, but you will encounter them often in public places and there are some parents that opt for the convenience of a fold down changing station. If you choose this unconventional style of changing table the most important thing is installing it properly on a wall that has the proper supports. If you are not certain what you are attaching the changing station to it is not a safe option and can be even more dangerous if it pulls out of the wall while it is in use. 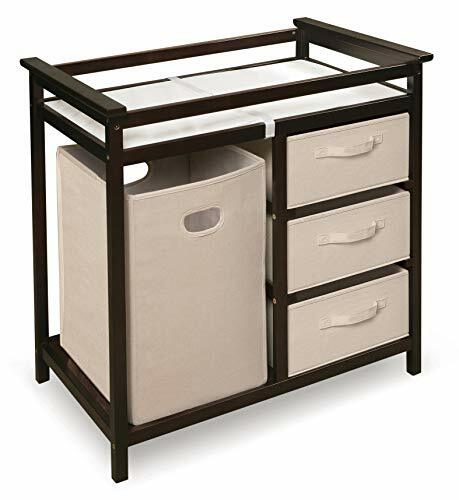 Dresser Top Changing Table – This type of changing area can be good IF there is a guardrail around the top of the dresser. Using a regular dresser and putting a changing pad on top is not a good method for setting up a changing station. The pad can slide right off the dresser unless it is affixed somehow. Also make sure that the changing pad top has 2-4 contoured sides. Don’t choose the flat pads for this type of changing table. Choosing a baby changing table can be a fun experience if you know what to look for and what to avoid. With all of the choices available on the market, it helps to know a little bit about what makes a good purchase. It is a piece of baby furniture that provides a lot of convenience which is why it is so popular among parents. The information in this buyer’s guide was designed to help you sort through all of the choices so you can easily find the perfect baby changing table for your baby’s nursery. The three top rated changing tables reviewed above are excellent, good quality choices that will provide for all your diaper changing needs while style providing plenty of style. Once you know what to look for, you can look through the choices, eliminate the ones that don’t meet your needs and choose your favorite. When you experience how convenient they are to use, you will really be glad that you added this to your “must have” list for your baby.